Mary-Kate and Ashley Olsen as Elsa and Anna (photoshop). At least I think it's photoshopped. I don't know who did it. 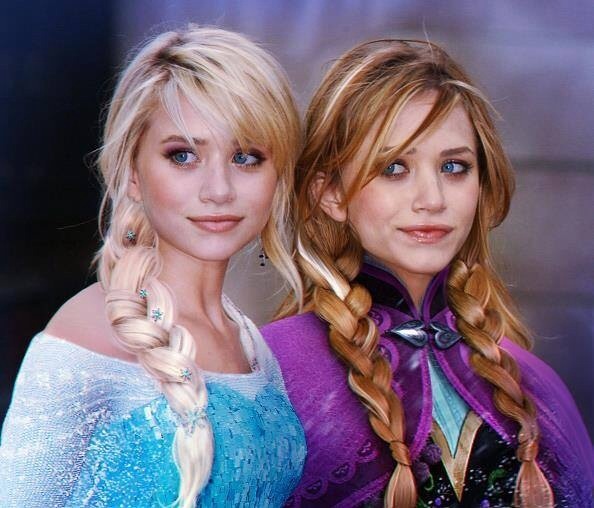 I saw it on the Elsa facebook fan page.. Wallpaper and background images in the princesas de disney club tagged: photo disney princess frozen anna elsa mary-kate ashley olsen. This princesas de disney photo might contain vestido de cóctel, la vaina, vestido de coctel, vestido, retrato, tiro en la cabeza, primer, headshot, primer plano, en la cabeza, and closeup.